"There Is Nowhere On Earth A Man Can Escape Death" commences this concept release by Marquis De Blood. An unsettling yet initially optimistic feel to this track is perhaps made more unsettling due to the melancholy key used strategically and intelligently. The ambient tone is immediately achieved- aided by some truly beautiful string overtures artistically layered with samples. The electronica changes cadence rapidly into a slower and consistently mournful feel characteristic of "The Mourning Dawn". A refrain befitting of Victorian horror sets the tone for this release- the mid track interlude proves to be oddly soothing while allowing the keyboard music to stand out against the understated yet stirring string background. Giving way to a final organ refrain finalizes a track full of melancholy, soul and vibrato. "Death Knocks Three Times" commences with a resonant sample of an insistent knocking combined with a more frantic feel to the string music- giving the impression of a sense of urgency bordering on panic along with a remarkably discordant feel. The characteristic frantic string and orchestral background music offset by a tingling, treble line further add an off-putting element to this track. Grinding and crashing samples added to "Death Knocks Three Times" further serve this purpose and aid to the atmosphere. Ending with an abrupt bang and a whispered "No" further reinstate this track as unsettling yet enjoyable. "Arsenic Waltz" begins as with an oppressive overtone resonant with orchestral overtures. Shifting faultlessly into an uplifting yet austere interval reflective of the Victorian time period and moving swiftly into an intense interval while switching tempo rapidly ensures the listener will be enthralled. Moving from a dreamy yet dramatic orchestral combined with consistent and chaotic intervals complete this dramatic and melancholy track. Quite beautiful and brilliantly orchestrated- an attention-grabbing track rife with melancholy and ambience. 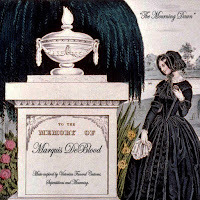 "Black Wreath" commences with the consistent dramatic and operatic string music consistent of this release- while remaining very much reflective of the Victorian period stated in Marquis De Blood's concept. Branching into an eerie choral sample background combined flawlessly with string music as a dominant force- the effect is haunting and beautifully melodic. The next section provides a brief electronic strain seamlessly moving back into a resonant harmonised sound- while the sudden end is dramatic and theatrical in its approach. "The Covered Mirror" begins with the string overture typical of "The Mourning Dawn" but nevertheless fails to strike you as musically impressive instantly. A faster paced, and frantic cadence demands your attention mid-section through the use of dramatic string pieces while the continual shifts show the technical precision required to accomplish the coherence of "The Covered Mirror". 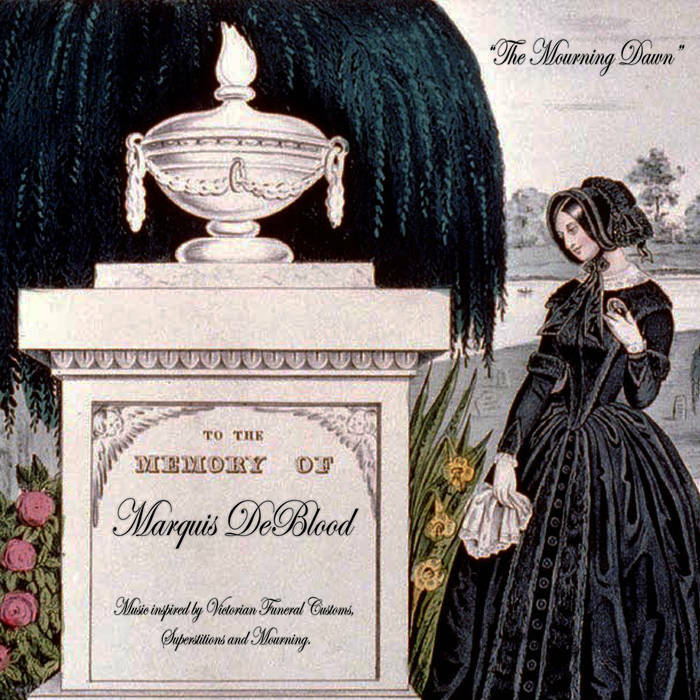 An eerie piece that encourages the listener to listen twice for those things that go "bump" in the night- precisely what Marquis De Blood wished to accomplish. "Casket Spray" commences with the characteristic string orchestral rapidly shifting into a slightly more mournful feel. A dramatic overtone sets the tone for a Victorian mourning aspect associated with wakes. Provoking visual images of the mourners ensures the listener is instantly transferred into the mourning party out-lined in the concept and ambient tone of this release. Highly emotional and laced with mournful regret- a conceptually and musically sound track consistent with "The Mourning Dawn" concept. "Funeral Procession (The Black Parade)" starts with ambient and commanding organ pieces spliced with a sample of pitiful weeping- adding a heart-rending feel to this track. A highly forward and dramatic string background provides an oddly mournful yet uplifting tone while the choral interlude enhances this tone further. Shifting back into haphazard chaotic strings with a forceful abrupt ending adds to an unsettling but cohesive mid-release track. Manic in the grief of a loved one- this track is remarkably true to the conceptual time frame. "The Mourning Dawn"- the namesake track of this release, commences with the characteristically orchestral sound resonant to this release. String intervals rich with mournful and depressive understated piano intervals add an almost ethereal quality aided by the samples of Gregorian chanting. This highly artfully layered and masterful track is resonant and undeniably beautiful while catching your ear almost instantly. "Weeping Veils" commences with a Dante-esque sample of the dead, reminding you of the circles of hell. Mourning, chaotic with a hunted feel add to this track which sits aptly with the concept of the morbid fear of the dead- ensuring this track is conceptually sound. Psychological in its approach- "Weeping Veils" brings you an invaluable and confrontational insight into the Victorian mindset. Ambient with wailing strings and rippling piano lines combined with electronic shifts ensure an enthralled listener. "The Empty Chair" begins with attention- commanding organ samples split with deep Gregorian chanting. Moving swiftly into an emotional orchestral interlude enables the listener to feel the sadness of the mourning family. A chaotic, off-kilter and fast paced interlude feign forced cheerfulness- the slow paced Gregorian chant provides a conflicting peaceful contrast while remaining regretful and pensive. The keyboard interludes are the focus in this track and rightfully so- an interesting and intelligent track. "Remember Me (Memento Mori)" is a befitting concluding track to offset this dramatic and ambient release. Enchanting, rippling guitar riffs and keyboard interludes offset with an understated string background music. Switching cadence rapidly while incorporating whispered tones and samples ensure a typical dramatic and forceful conclusion to "The Mourning Dawn" while still providing a chaotic and vibrant tone. An ambient track both chaotic and aesthetically pleasing in its highly layered and masterful delivery. I loved the 'blow by blow' commentary! !Thanks for taking the time!! And I'm glad you enjoyed it!